A rich, berry red with a small amount of shimmer… I’ve worn this beautiful shade plenty of times since I received it at a press event last year but never as ‘full on’ as this. I usually apply with my fingers and blot it down to a stain but in the image above, I’ve applied with a lip brush before blotting on a piece of tissue. I would feel far too conspicuous to wear this so bold in the daytime but I reckon I could give it a go on an evening out? Longevity was really good on this one… 4 hours of near perfect wear despite drinking and munching on a packet of crisps. Plus, as it fades… I think I love it more as it gives a sexier, slightly smudgy round the edges look. Extravagant Berry is a limited edition shade that was released for Christmas 2010… it’s still around, but won’t be for much longer! It looks so wonderful on you! Really WONDERFUL LOOKING! It suits you very well! Absolutely beautiful – like this very much on you! I have this and it doesn’t suit me. I’m jealous because its a beautiful colour and really looks fab on you. This is definitely my favourite red so far! Wow. This is my favourite on you by a long shot. Very glamourous! This looks PERFECT on you! This colour is beautiful. Looks gorgeous in the tube, too – that gold shimmer is lush. I love this one on you! It makes you look young and fresh-faced. Your expression here too, you look naughty. All in all a winner, love. You’ve seemed to have lost more weight! great going! down to normal already luv? Ok..this is my favorite on you! Wow! Absolutely stunning. That’s a verrrrryy nice shade! No, no , no and no : don’t just use it for a night out….Such a waste, it looks wonderful on you…This is a fantastic color on you, FANTASMABULOUS …. That looks PERFECT, wear it always, wear it to the supermarket, wear it to the friggin’ shower! My favorite red on you so far, the first red that doesn’t look orange on you. That red looks gorgeous on you! It’s lovely, even in the tube it looks fab! Oh wow, that is absolutely stunning on you!!! I have similar skintones and now really want this ^.^ Especially because of all that gorgeous gold shimmer on the bullet! gorgeous gorgeous color! looks especially good on you! =)…wish we have them here in Manila. 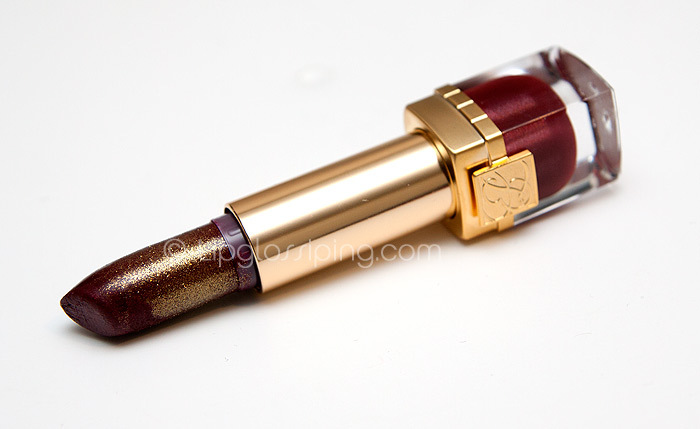 I’m perplexed… the lipstick image shows a wonderful deep dark red with golden shimmer. On lips just the so-common red that each brand has. I’m really disappointed. Very old Hollywood, VERY glamorous! You look amazing. 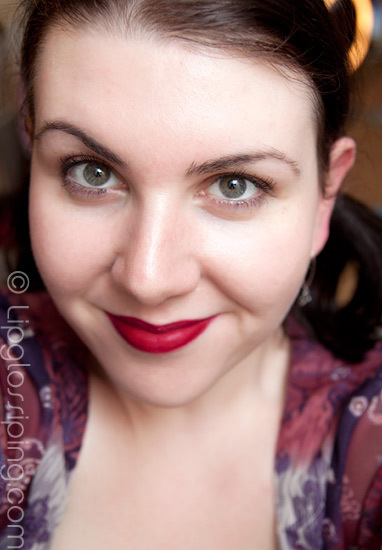 As a rule I hate red lips – on me or on anyone as it looks, gosh how can I say this without being rude or insulting – common? BUT! By god this is a lovely red! I can’t wear red at all as I have olive toned skin and bright red dyed hair and red lips just clash big time, but I can honestly see myself at least trying this. It’s really lovely! Wow, it is beautiful…. and the lipstick itself looks very very pretty! I think this colour looks absolutely AMAZING on you! An Autumnal look for the new Boots Opticians range! Oh Hai American Apparel! My eyes called, they want their retinas back. Scholl introduces the moisturising sandal!